A. The Church has no specific “rules” for or against applause at Mass, so we are left to reason for ourselves according to what comports with the purpose and spirit of the liturgy. Fundamentally, I agree with your observation. 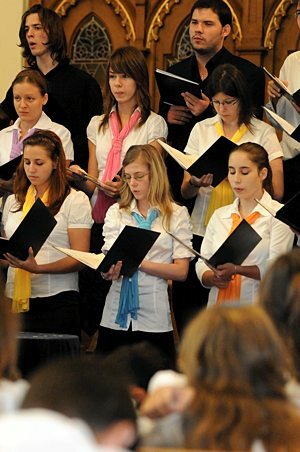 Music during Mass, whether sung by the choir or by the congregation, is not a performance. It is meant to glorify God and sanctify the faithful. It is a form of prayer and should draw those present into deeper contact with the Lord. There are moments in certain liturgical celebrations when applause is welcomed, although not explicitly called for. For example, in the ordination of priests, there is a point at which the congregation is invited to give its approval to the candidates “according to local custom,” which in the United States usually results in applause. Apart from such instances, it seems inappropriate during Mass to break the flow of the liturgy and spirit of prayer by clapping. Having said that, we are properly grateful to musicians and singers for adding beauty and reverence to the celebration of the Mass. Perhaps that gratitude could best be expressed once the closing hymn is completed — either by applause or by taking the time to compliment members of the choir personally. A. You are correct on the Church’s teaching. Although the Vatican in 1963 lifted the ban on cremation, the Church specifies that cremated remains are to be treated with the same reverence as the body of a deceased person. This means that the cremains are to be placed in a worthy vessel and, following the religious services, to be buried or entombed in consecrated ground. They are not, for example, to be kept on a mantelpiece or scattered in the deceased’s favorite park. I think this is a “teachable opportunity” for you. You should tell each of the two that, as a faithful Catholic, you would feel (in your words) “uncomfortable” carrying out their wishes and then go on to explain to them the reason for the Church’s guidelines (i.e., reverence for the cremated remains). Father Doyle writes for Catholic News Service. A priest of the Diocese of Albany, N.Y., he previously served as director of media relations for the U.S. Conference of Catholic Bishops.